Strong assurances from OPEC and Russia regarding the extension of the production cut deal has pushed oil prices above $60 per barrel, providing a confidence boost for oil bulls and possibly bringing oil prices into a new higher range. - The Haynesville shale gas basin along the Louisiana-Texas border has seen a resurgence this year. 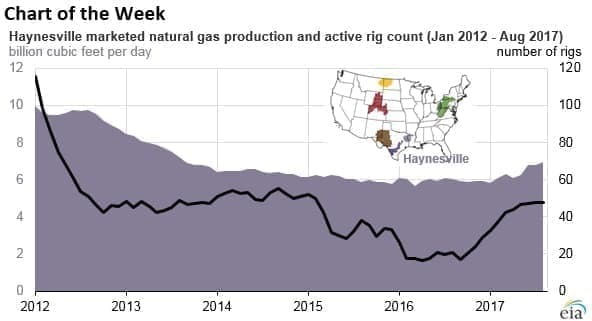 - The Haynesville was one of the earliest shale gas plays, having scaled up a decade ago and then declining in 2012 as the industry shifted en masse to oil drilling. - Now, armed with a decade of experience and new drilling techniques, shale drillers are back in the Haynesville. 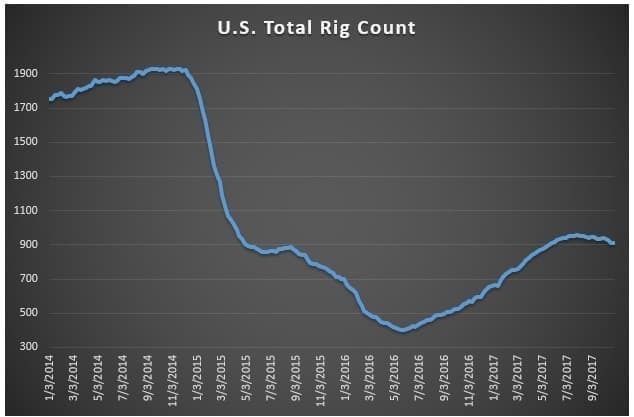 Shale gas production has jumped from 6 billion cubic feet per day (Bcf/d) for the past three years up to 6.9 Bcf/d more recently. - Statoil (NYSE: STO) said it will not abandon the Arctic after a disappointing drilling year in 2017. Statoil found no commercial volumes of oil in its highly-anticipated Korpsfjell project. But the company needs to replace falling output and believes the Norwegian Arctic still has huge potential. - Precision Drilling (NYSE: PDS) saw its share price skyrocket by 21 percent over two days on rising oil prices combined with impressive third quarter results. Analysts see strong free cash flow and the North American drilling rebound as positive for Precision. - Cabot Oil & Gas (NYSE: COG) is up more than 12 percent since reporting a sharp increase in third quarter production. Oil jumped to $60 per barrel on Friday, and held those gains on Monday, an early sign that the oil market could be entering a new phase. Brent topped $60 per barrel for the first time in nearly two and a half years. The strong assurances from OPEC and Russian officials has the market assuming that the upcoming OPEC meeting in November will result in an extension of the production cuts, perhaps through the end of 2018. With that extension in hand, the oil bears are in retreat. Saudi crown prince supports OPEC extension. The powerful crown prince said that he supports an extension of the OPEC cuts, the strongest signal yet that the November OPEC meeting will lead to an extension of the production limits. BP to restart share buybacks. BP (NYSE: BP) said that it would restart its share buyback program after reporting a replacement cost profit – similar to net income – of $1.4 billion in the third quarter, down a bit from $1.7 billion a year earlier. The company declined to reveal a value on its buyback plans. The British oil giant had scrapped share repurchasing back in 2014 amid falling oil prices, but has made strides in adapting to lower oil prices. BP said that it can breakeven with oil prices at $49 per barrel. WTI backwardation coming. Reuters argues that falling U.S. oil inventories are a sign of a shift towards backwardation for WTI, a state in which near-term oil contracts trade at a premium to longer-dated oil futures. With Brent already in a state of backwardation, the downward sloping futures curve for WTI would be another signal that the oil market is tightening. Backwardation tends to appear during periods of market tightening and would suggest higher oil prices are possible. 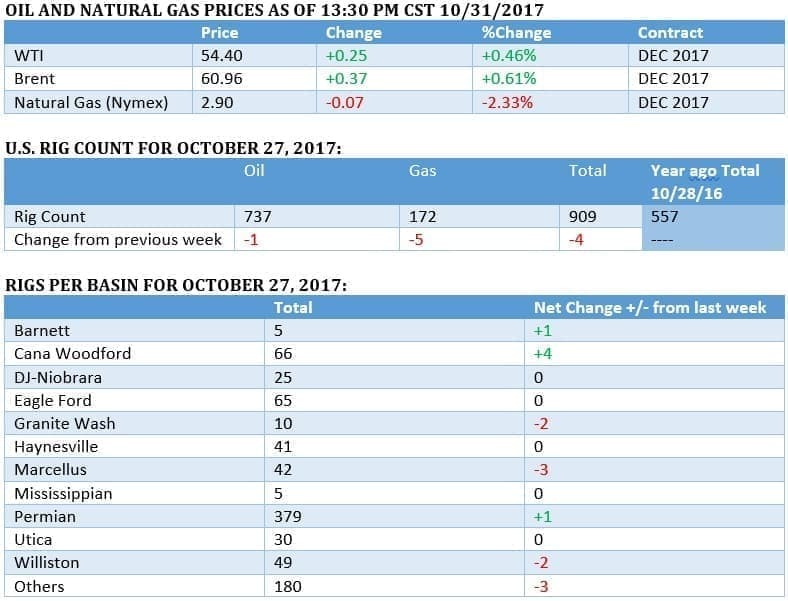 Appalachian gas can’t keep rising. A top executive from Range Resources (NYSE: RRC) said that shale gas production in Appalachia – home to the Marcellus Shale, the most prolific in the U.S. – cannot continue to rise on its upward trajectory. Appalachian gas drillers will eventually experience "sweet spot exhaustion," Alan Farquharson, senior vice president of Range Resources, said at an industry conference. "As you drill longer and longer laterals, it minimizes the number of wells it takes to develop that core position," Farquharson said. "As a result, the core of the acreage gets drilled up, you have to step out to tier one, tier two and tier three wells, which means you get lower productivity per well." Saudi Aramco IPO “on track,” but where will it list? Saudi officials have tried to stamp down speculation that they will abandon the highly-anticipated partial IPO of Aramco. But as Bloomberg reports, they have been careful not to reveal where the listing might occur, meaning they could still opt for a domestic offering only. "We have said publicly that Tadawul is for certain,” Mohammed Al-Jadaan, Saudi finance minister, told the FT, referring to the Saudi stock exchange. "Are we going to go with an international market? If we go, where are we going? And if we go, are we going public or we are going private?" Trump to roll back protections for Bears Ears. President Trump will reportedly travel to Utah in December to announce a shrinking of the borders of Bears Ears and Grand Staircase-Escalante national monuments. The paring back of protection for public lands is relevant to the energy industry in the case of Bears Ears, where some shale drillers have been interested in exploration. Free-market groups come out against possible solar tariff. President Trump is considering tariffs on imported solar panels, a move that could decimate the solar industry in the U.S. But 10 free market conservative organizations are lobbying the White House to reject import tariffs. "If trade restrictions are imposed, the cost of solar products in the United States could double, endangering tens of thousands of good-paying domestic jobs within the solar industry," the conservative groups said in a letter sent to the president. Futures contract to be launched for lithium and cobalt. The London Metal Exchange (LME) said that it would launch futures contracts for cobalt and lithium as soon as 2019, a recognition that the push for electric vehicles has drastically ramped up demand for a variety of metals. The LME will “be working with the battery and electric-vehicle industries over the coming months to deliver new contracts such as lithium and cobalt sulfate to bring price risk management to this rapidly growing market,” the exchange’s CEO Matthew Chamberlain said in a statement. Sinopec considering U.S. investment to boost access to crude. Sinopec is weighing investments in two major U.S.-based projects as means to gain access to more U.S. crude. One project is a pipeline that would connect Permian oil to the U.S. Gulf Coast for export. Sinopec and some U.S. partners are exploring crude storage facilities in the Caribbean.